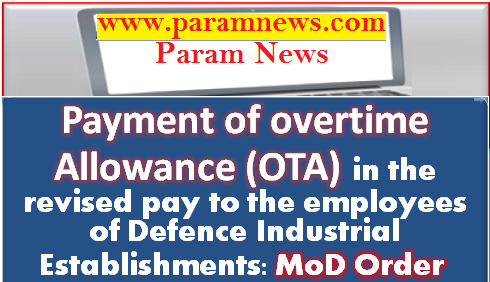 Subject: Payment of overtime Allowance (OTA) in the revised pay to the employees of Defence Industrial Establishments governed by the Factories Act, 1948. Consequent upon revision of pay structure as per VII CPC recommendations, the matter regarding payment of OTA, as per revised pay, to the employees of the Defence Industrial Establishments under the Factories Act, 1948 has been considered in consultation with the Ministry of Labour & Employment, Ministry of Finance and Ministry of Law & Justice. 2. It has been decided that the Overtime Allowance shall be paid to the employees of the Defence Industrial Establishment governed by the Factories Act, 1948 on the basis of revised wages with effect from the date the wages have been revised i.e. 1.1.2016. The OTA on the basis of revised wages is subject to the conditions stipulated in this Ministry’s OM No. 14(1)/97/D(Civ-11) dated 1st July 1998. 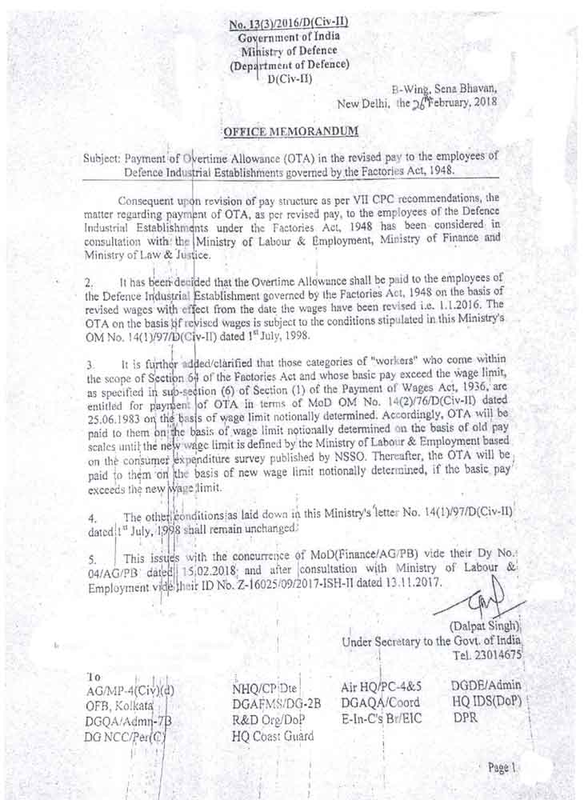 3.It is further added/clarified that those categories of “workers” who come within the scope of Section 64 of the Factories Act and whose basic pay exceed the wage limit, as specified in sub-section (6) of Section (1) of the Payment of Wages Act, 1936, are entitled for payment of OTA in terms of MoD OM No. 14(2)/76/D(Civ-II) dated 25.06.1983 on the basis of wage limit notionally determined. Accordingly, OTA will be paid to them on the basis of wage limit notionally determined on the basis of old pay scales until the new wage limit is defined by the Ministry of Labour & Employment based on the consumer expenditure survey published by NSSO. Thereafter, the OTA will be paid to them on the basis of new wage limit notionally determined, if the basic pay exceeds the new wage limit.